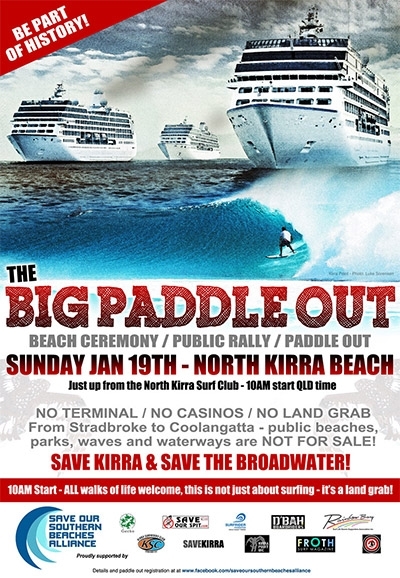 Organizers of this Sundays Big Paddle Out Event have debunked a comment from the Gold Coast Mayor's office published online that the Gold Coast Ocean Terminal proposal for North Kirra/Bilinga is nothing more than a plan written on the back of a napkin and that this Sunday's Big Paddle Out at North Kirra is a protest over nothing. Save Our Southern Beaches Alliance has produced clear evidence that the threat is real justifying the need to demonstrate with the Big Paddle Out Event for this Sunday at North Kirra against any such public land development on the 38km strip from South Straddie to Coolangatta. On the eve of the Big Paddle Out Event for this Sunday 19th January at North Kirra where the public have been invited to protest their opposition to the proposed $2billion dollar Ocean Terminal, a war of words has erupted between the GC Mayor's office and Organizers of the Big Paddle Out, Save Our Southern Beaches Alliance. According to reports in an interview published online from the Australian Surfing Life ASL Magazine, Hermann Vorster, Media Advisor for GC Mayor has been quoted as saying that the organizers of the Paddle Out are protesting over nothing, and that the so called plan was written on the back of a napkin. "It's nothing more than a sketch on the back of a napkin, despite what you've heard or read or even what the developers have said. There has been absolutely no proposal put to council or the state government. Practically speaking, there's nothing to protest against except a fanciful sketch. 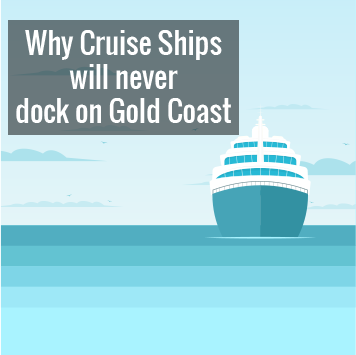 It's an idea that completely ignores the political reality, which is that the council and state government only have one project for a cruise ship terminal." However a spokesman from SOSBA reiterates their position that the plan is real, that the Gold Coast Ocean Terminal received Federal Government approval re a 25 page report (link provided below) and that SOSBA has provided clear evidence of the Gold Coast Ocean Terminal's intention with the consultant's plan graphically illustrating the size and magnitude of the proposal. "I completely debunk Hermann's interpretation that this plan has been written on the back of a napkin as you can see from the graphic illustration from a consultant for the proponent. It is far from that. Our campaign has now embraced the campaign of fighting for the Broadwater and Kirra against such a coastal development that reclaims public land from South Straddie to Coolangatta. We will re-enforce that message at this Sunday's Big Paddle Out Event." The Gold Coast Mayor Media Advisor, also accuses Andy Mac of not applauding the Mayors achievements with the completion of Big Groyne Kirra. "We fought for the last 10 years to have Big Groyne rebuilt and are naturally delighted that the Mayor followed our repeated calls. Initially Tom Tate's office had said as reported in the media that Mick Fanning could build it (Big Groyne) when the Mayor was not impressed with Fanning's support of SAVEOURSPIT campaign opposed to the Mayors Broadwater plan of Cruise Ship Terminal on the public land of Wave Break Island. Initially the Mayor walked away from his commitment to Big Groyne Kirra and then back flipped to renew his promise after a public outcry. We are indeed thankful that he honoured his Mayoral pledge. And I am personally happy that the Mayor took the idea I proposed of dedicating the resurrection of Big Groyne to my friend the great and late "King of Kirra" Michael Peterson." SOSBA would like to say that this campaign of ours is not a beef with the Mayor who won't say what his position will be re the Gold Coast Terminal at North Kirra if his Broadwater Plan is defeated by QLD State Government, who will meet in February to make a decision. "Our campaign is not about denigrating personalities and politicians, it's about creating public awareness and driving a new policy of No Cruise Ship Terminals, No Casinos, No Public Land Grab on our Coastal Strip from South Straddie to Coolangatta and asking State Government to once and for all reject this type of development for the Gold Coast. We maintain the Port of Brisbane is a far better venue for a development of this magnitude. Ultimately it is the State Governments decision on the Broadwater and if rejected, the focus swings back to the North Kirra Bilinga proposal and the Ocean Terminal becomes a real threat and not something written on the back of a napkin. That is why we are paddling on Sunday to demonstrate against this type of development on public land that can threaten our greatest natural assets on the Gold Coast strip from South Straddie to Coolangatta.